Brooklyn’s My Teenage Stride make Smiths/Jesus+MaryChain-influenced pop. 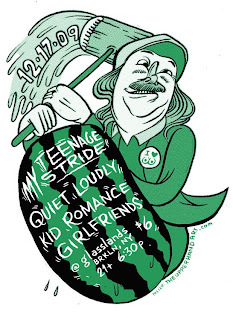 Joining them at this show are shoegaze/psych act Quiet Loudly, Kid Romance, and lo-fi band Girlfriends. With one of the best burgers in Williamsburg, Dumont Burger offers theirs with gourmet toppings, sandwiches, salads, and their amazing mac & cheese. So you consider yourself a beer connoisseur and like to party. You can do all that and eat at Radegast Hall & Biergarten. The Austrian/German menu perfectly compliments the 12 beers on tap and more than 30 German and Austrian bottles at this large beer hall. One of the oldest and best hipster hangout coffee shops, The Verb Cafe offers up excellent coffee and baked goods, a boho vibe, and big windows to watch the days pass while collecting unemployment!